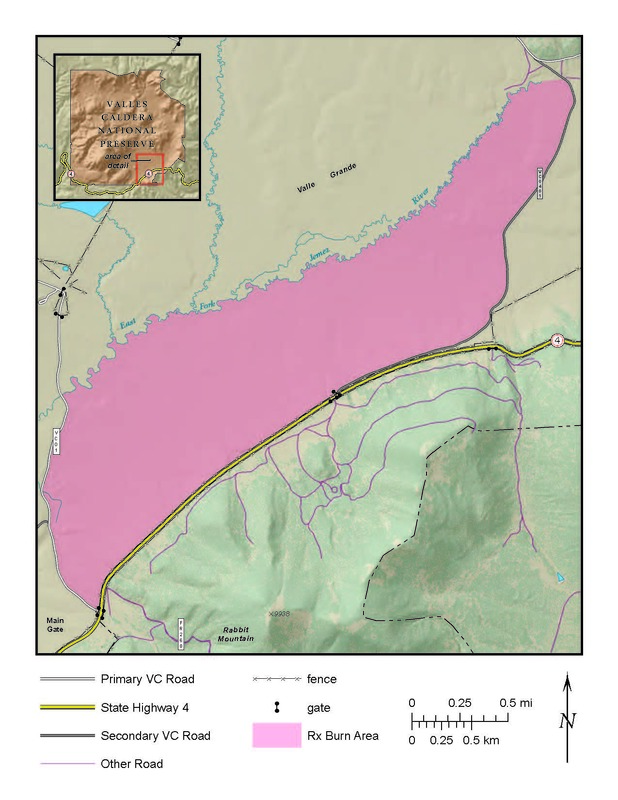 The Valles Caldera National Preserve is planning to implement a prescribed burn project on the preserve that will begin as soon as Wednesday, May 11 and be completed within two to three days. The prescribed burn will target up to 1,471 acres of grass in the Valle Grande, adjacent to NM Highway 4 between mile markers 39-42. Traffic delays may occur during the ignition phases of the burn, but we do not anticipate any road closures. If conditions permit, burn operations will occur during mid-day in order minimize impacts to morning and afternoon commuter traffic on NM Hwy. 4. The preserve will remain open to the public and activities will continue as scheduled. However, fishing on the East Fork of the Jemez and lower section of Jaramillo Creek will not be permitted while the burn is in progress and until the burned area has been cleared for public access. The primary objective for this particular burn is to improve diversity and resiliency of ecosystem processes through the reintroduction of fire on the landscape. This is an area of the Preserve that has not burned in either the Las Conchas or the Thompson Ridge fire. The parameters for implementing a prescribed burn are based upon specific assessments, agency guidelines and safety protocols. Managers continuously monitor weather conditions during a burn including wind, temperature, and relative humidity. Fuel quantity and moisture are also measured. The project will not begin unless all conditions support the burn and associated resources are available. If conditions are not right, the burn may be delayed until later in the season. Because of the location and elevation, smoke from the burn will be visible from all directions coming into the Jemez Mountains area. Smoke is expected to have variable effects on neighboring communities including Ponderosa, La Cueva, Sierra Los Piños, Jemez Pueblo and areas near NM Hwy 4. Communities along US Highway 550 including San Ysidro, Zia Pueblo, Bernalillo and Rio Rancho may also be affected. Smoke may be a health concern for children, pregnant women, senior citizens, and those suffering from allergies, asthma, chemical sensitivities, or other heart or lung diseases. To reduce exposure to smoke, stay indoors as much as possible with windows, doors and vents closed. Avoid or limit physical activities outdoors. In the evenings, smoke settles into low lying areas, including drainages, and lifts by mid-morning when the sun rises. Residents living in such low-lying areas may be most affected. Information on health impacts from smoke can be found by calling the New Mexico Department of Health at 1-888-878-8992, or visit: https://nmtracking.org/fire . About 1.25 million years ago, a spectacular volcanic eruption created the approximately 13-mile wide circular depression now known as the Valles Caldera. The preserve is known for its huge mountain meadows, abundant wildlife, and meandering streams. The area also preserves the homeland of ancestral native peoples and embraces a rich ranching history. Visit us at www.nps.gov/vall. More than 20,000 National Park Service employees care for America’s 410 national parks and work with communities across the nation to help preserve local history and create close-to-home recreational opportunities. Visit us at www.nps.gov, on Facebook www.facebook.com/nationalparkservice, Twitter www.twitter.com/natlparkservice, and YouTube www.youtube.com/nationalparkservice.